Last Thursday evening I noticed a couple of little puddles of pee in the kitchen. That was unusual because when Puck pees on the floor (which is just about every day) it is one large puddle. I then noticed more little puddles and soon realized that everywhere Puck went he left behind a puddle of pee. 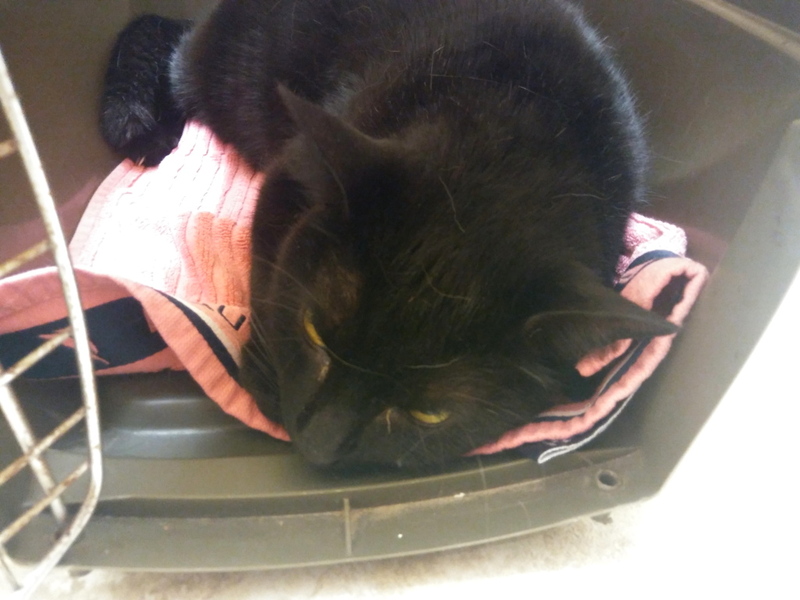 Even though peeing on the floor has become the new normal, this was not normal so I called the vet as soon as they opened and made an appointment for that morning. 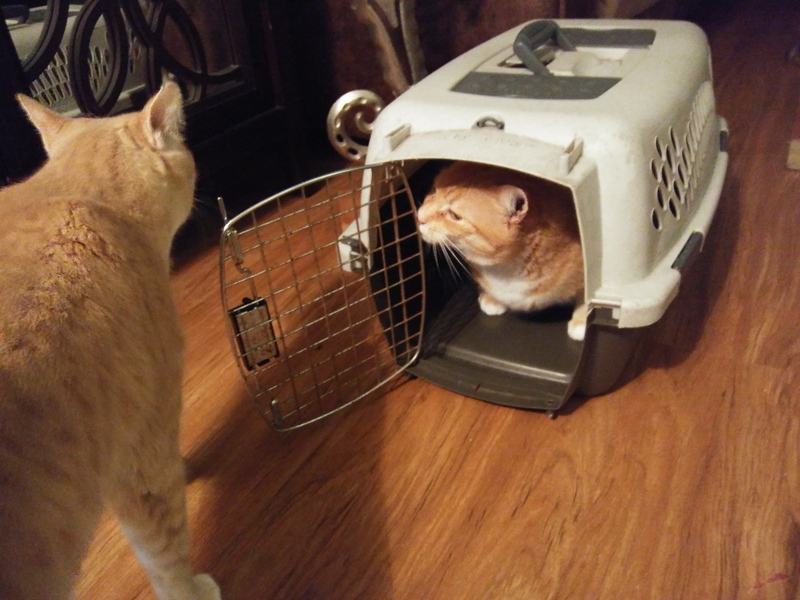 I brought the carrier in the house early so as to not scare Puck when it was time to go. Chris and Frankie not only don’t fear the carrier, they were taking turns going inside of it. Chris, of course, was first. 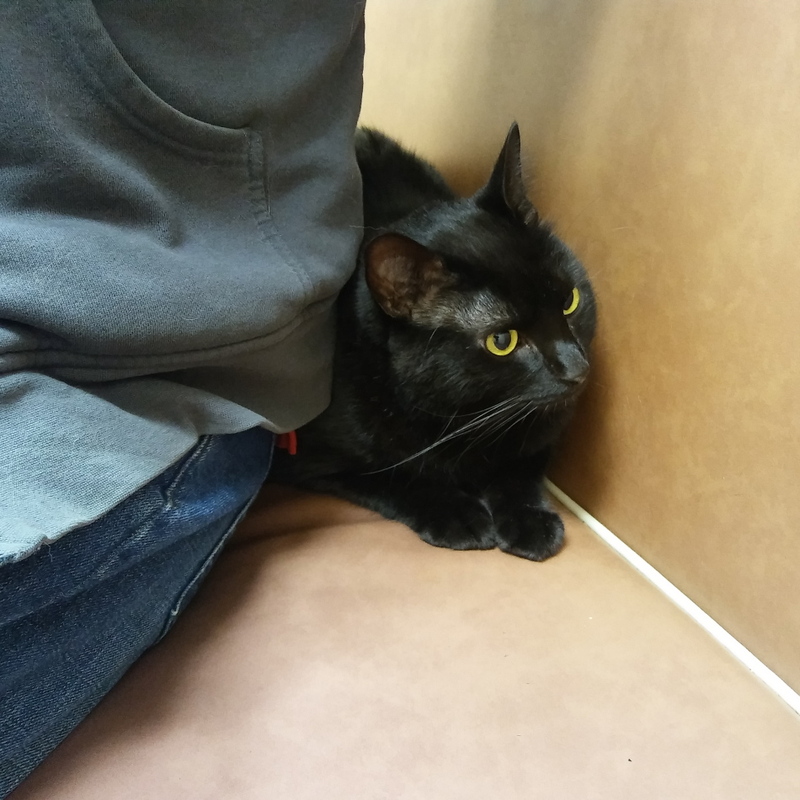 Puck sensed something was up and I had a hard time catching him but eventually we made it to the vet. I opened his cage after the put us in the exam room but he was not interested in leaving. 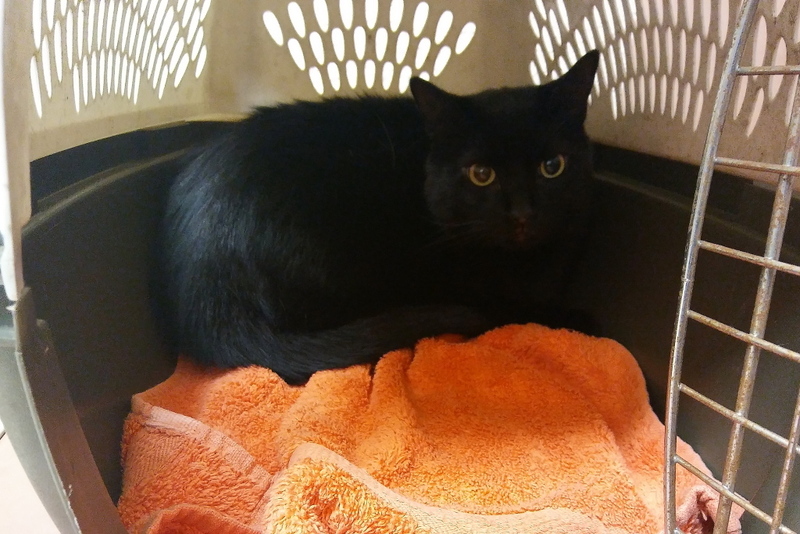 The vet tech took him in the back room where they do their secret experiments and brought back a cat that looked like Puck but I couldn’t be sure until later when he peed on the floor. While he was in the back they took a urine sample. After a short wait, the vet came in to examine Puck. 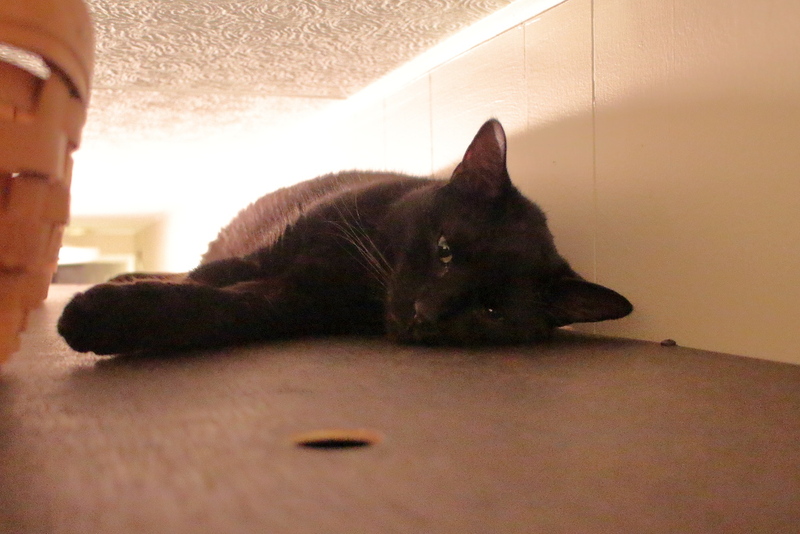 The vet tech struggled to pull him out and I suggested we just unsnap the top, which we did. The vet then suggested that she bring Puck over along with the bottom of the carrier. She thought that would stress him less. We then had to wait for the test results so I picked up Puck and put him in my lap. Apparently, that was not the time or place for doing anything out in the open so he jumped down and hid behind my back. 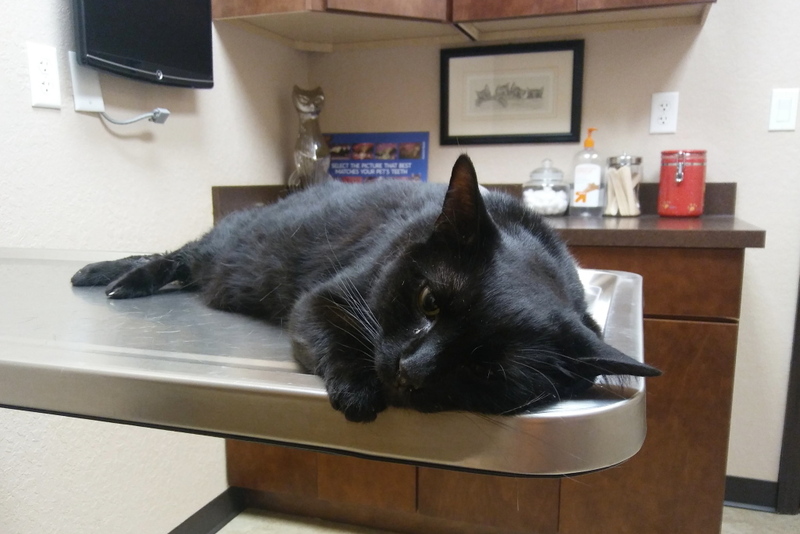 After a long wait, the vet came back and said that there was no infection but he did have inflammation and he had urinary crystals. She ended up giving Puck steroids. 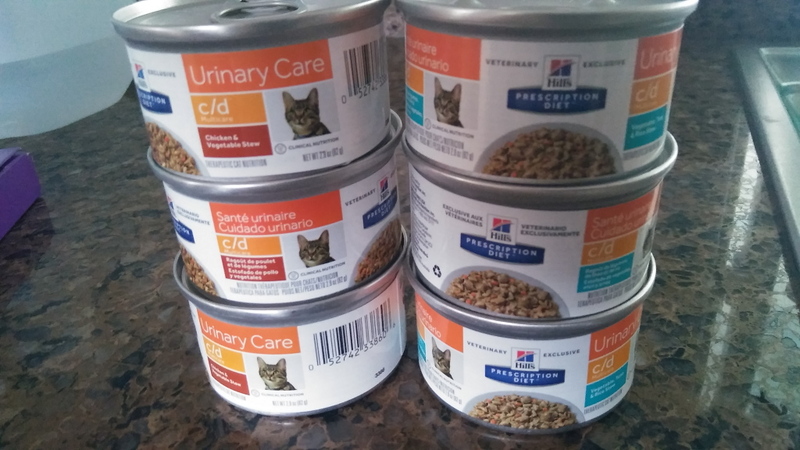 Every time I write about a vet visit I mention how all pet issues are solved with steroids or antibiotics and each time after that the same thing happens, In addition, I had to buy another case of Hills prescription cat food. He didn’t pee anywhere the first day after the vet visit but the day after that he peed everywhere, Today he was good but we will see what tomorrow brings. 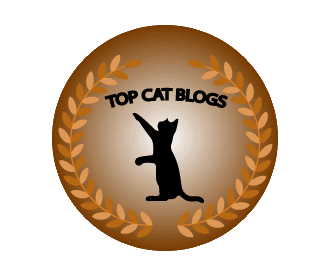 This entry was posted in Uncategorized and tagged cat, pee, urinary tract, vet on January 30, 2018 by Charles Huss.